Bring your service to an entirely new level with PORTOS. The unique possibilities offered by QBF portal solutions will delight your customers. By using PORTOS, your customers will be able to create and track their orders. Through integrated soft-proof solutions, approvals will be simpler and faster. This Internet portal will also significantly improve and automate the exchange of job information and associated files. Thanks to PORTOS, your customers will have a seamless overview of all job details – anytime, anywhere. What’s more, PORTOS offers optimal approval management, logs for notes, access to the job archive, report preparation – and much, much more. As the primary project portal for your customers, PORTOS can even organize processes that involve multiple parties and diverse packaging components. Your benefits? Transparent and error-free communication with your customers, comprehensive automation, and – most importantly of all – incredibly satisfied customers who can’t do without your service. 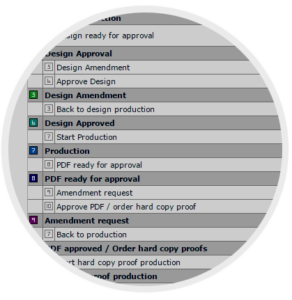 This is an example for an approval workflow which can be implemented in Portos. But there are even more possibilities – we are happy to answer your questions! The customers themselves can create an order after logging in and specifying data in the order entry form. Or they just pick one from the archive for a remake plate order. As soon as all data are complete, the customer sends the request. Your CSR will be automatically notified. After acceptance of the order, the artwork production or prepress can start. After creation of the proof (PDF) it can be quality-checked and then approval from several parties may be requested. The next step is the approval by the customer. Several parties can be involved, different approval scenarios are possible. After the approval, the job goes to print production. 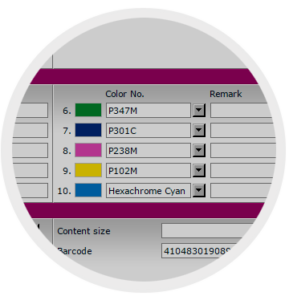 E.g., plates are produced or data are sent directly to the printer. After completion of the order it can be processed to the archive area of Portos. When this step should occur is subject to individual configuration. In the PORTOS web portal, customers can directly send orders, supply information and upload files. There is no more time-consuming e-mail correspondence and all information is documented in one place. And not only that: Every job is available in Aramis in real-time and can be processed further immediately. You and your customers want the same thing: a simple, transparent, and error-free exchange of job information and approval specifications. That’s exactly what the PORTOS Standard Portal offers – customized for your operations. Specific information can be retrieved and displayed for each job. In PORTOS, even the way information fields are displayed can be customized as you see fit. Furthermore, approval PDFs and other files can be uploaded to the Internet platform and will then be available as part of a common data pool. Automated procedures take place with each initiation of a job or change in the process. E-mails automatically inform you of upcoming steps. All processes are logged and trackable in the job history. In addition, an automatic exchange of data takes place with the ARAMIS MIS from QBF, and this feature is also available for other systems by request. Each link in the supply chain has its own process path, along which each of the involved parties can orient themselves. This includes deadlines, which can even be generated automatically if so desired. All processes run together in an overarching parent project path. User rights control how much the individual parties are able see and edit. In addition, each user can filter and sort project and job lists according to individual criteria.